Yewbarrow\Ubarrow Hall sits in the Longsleddale valley above the river Sprint. In some historical documentation, the hall is known as Ubery Hall, thus making research difficult at times. Above. 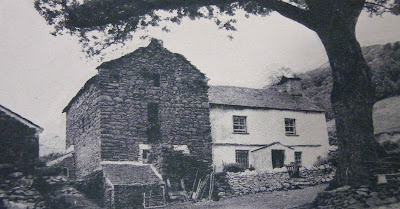 Photo from an old newspaper cutting, showing the cottage built into the tower's North West wall. Above. A zoomed in view of the tower. 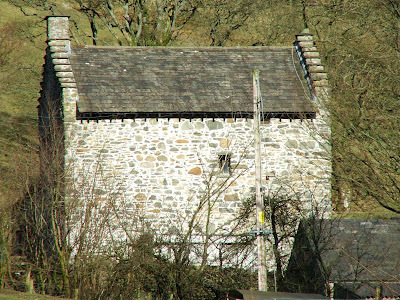 It is a Tower house built in 1450 and is the oldest building in the valley of Longsleddale. Above. The tower from the South West. The hall was probably granted to Robert de Leybourne, and later passed through marriage to a younger brother of Harrington of Wreysham (Wraysholme) of Lancashire. The name of the 'younger brother' isn't known. The hall remained in the Harrington's family for several generations. During the reign of Henry III, a rent of 1 shilling was paid to Queen Katherine for the hall. The tower, visible from the roadside, is around 32 feet by 22 feet, and sits at the West end of the current farm. Formerly of three storeys, the tower is now only two storeys tall. There is a vaulted basement, which was used as a dairy, accessed by a narrow passage broken through the 6 feet thick walls. This basement was originally a square roofed room, and from personal examination, it is plain to see that that vaulted ceiling is a later addition, as it butts up against the external wall. The tower is now attached to a 17th century farm house. The entrance is via a very narrow door between the main house, and brings you out onto the ground floor of the tower. Immediately in front of you, a spiral staircase takes you to the first floor. The stair case is original, and was found by the current owner when renovating the tower in the early 1990's, buried beneath a pile of roof rubble. It consists of stone steps overlaid with slate. The tower was in a severe state of disrepair in the early 1990's, when the current owner took on the task of renovating it. A photo showed to me by the owner, presented the tower roofless and partially ruined. The owner has not only used most of the original masonry, but has also incorporated some original timbers into the roof, as well as restoring the door that many Internet sources state was the original entrance into the tower, to a window.